As Britain’s divorce from the European Union stumbles ahead, hardliners pushing for a full break are finding support in one foreign capital — Washington. Prime Minister Theresa May, who is barely holding on to power at home, found a frosty reception on her latest mission to Brussels as she struggles to sell Brexit on her terms. Nor is she finding much support from US President Donald Trump, who has openly questioned her Brexit deal, instead favoring a full break. Right-wing critics fear the current deal could leave Britain indefinitely in the EU customs union so as to prevent restoration of the border between Ireland and Northern Ireland. He suggested that the agreement could hold back a trade deal between the United States and Britain — which conservatives in both countries have dangled as an incentive if Britain leaves the European Union. “That would be a very big negative for the deal,” Trump said. US Secretary of State Mike Pompeo has also embraced Brexit since he took over from the less ideological Rex Tillerson. In a recent Fox News interview, Pompeo promised to pursue the vaunted US-Britain “special relationship” in the increasingly likely scenario of a “hard Brexit” without a negotiated deal. 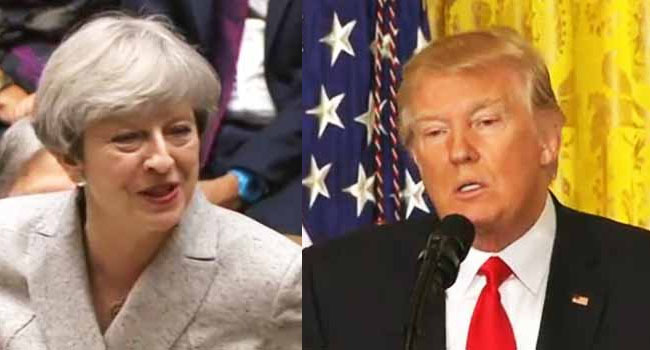 Trump’s enthusiasm for Brexit stands in marked contrast to the views of his predecessor Barack Obama, who had warned that Britain would be at the “back of the queue” for a US trade deal if it left the European Union. In line with the thinking of much of the foreign policy establishment in both countries, Obama said that a Britain integrated within a forward-looking European Union was better for all sides economically and politically. For Trump, Britain’s 2016 referendum to leave the European Union foreshadowed his own election, with few experts predicting the groundswell of support outside major cities. Nile Gardiner, an aide to former prime minister Margaret Thatcher now at the Heritage Foundation, a conservative US think tank, said Brexit was a natural philosophical fit for Trump. The American president has championed an “America First” policy suspicious of multinational institutions. Gardiner said that Brexit would also have a practical benefit for Trump in pulling Britain out of a common EU foreign policy. He said, for example, that a successor to May supportive of hard Brexit could part ways with the European Union on championing a denuclearization deal with Iran. Trump has enjoyed no support among Western leaders after exiting the multiparty deal negotiated by Obama and has reimposed punishing sanctions on Iran. A post-Brexit Britain would also be certain to steer clear of a common European defense separate from NATO, as proposed by French President Emmanuel Macron with the support of German Chancellor Angela Merkel, Gardiner said. Yet even as part of the EU, Britain has been the premier international ally of the United States, controversially joining the invasion of Iraq despite widespread European opposition. “Our objective at this point should be to contain whatever economic damage there may be from Brexit for both us and our allies. But also our objective should not be to make things worse for Theresa May or Angela Merkel,” she said. She said she doubted that Britain’s core international policies would change much after Brexit — but feared that a newly preoccupied Britain might be less active. “The UK is going to be so inwardly consumed with managing the impact of Brexit that we could lose a focused partner on the international stage for a period of time,” Magsamen said. A recent survey by Emerson College in Boston found that the US public lacks firm views on whether Britain or the European Union would be a more important partner after Brexit. But more than 90 percent of those surveyed said they valued a good relationship with Britain, with a strong majority supportive of a trade agreement.